Nothing gladdens my heart like seeing a new theater company grow and prosper. These are tough times for the arts, and the dedication of talented young people who choose to make their lives in its service is cause for celebration. Seven years ago, 11th Hour started life as the brainchild of some UArts grads. Like many good ideas, it was a simple one – here was a made-to-order ensemble, bound together through training and common interest. Why not take their work from the classroom to Philadelphia’s professional stages? And they could continue networking with UArts – especially their vital and expanding musical theater program. Each year has been bigger and more daring, and the 11th Hour folks have seen recognition of their fine work in positive reviews and enthusiastic audience response. Now, in addition to at least one fully staged production with an extended run, they do a series of concert musicals, often introducing Philadelphia to significant new work. This has become even more important since the Prince Music Theater closed its doors. Happily, there are new signs of life at the Prince, but 11th Hour will always be a welcome and valuable presence in Philadelphia, and one with a somewhat different mission – think of them as the edgy alternative to the Prince. Speaking of missions, their work is currently on display (through June 1) in a production of Altar Boyz. This ten-year-old off-Broadway hit – part boy-band tribute, part mock gospel (mockspel?) send-up – mostly wears its years lightly, though it is neither as naughty nor quite as funny as it once seemed. But there are some good jokes and even better songs. 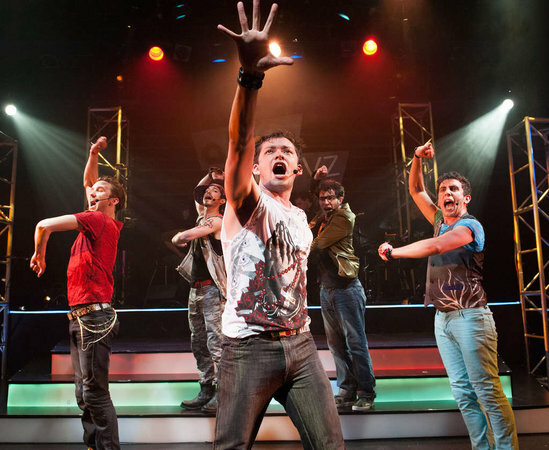 Best of all, the show has always served as an opportunity to showcase talented up-and-coming male performers (one way to think of Altar Boyz is as the world’s biggest onramp for future Fiyeros), and that’s the case here. Robert Hager, Adam Hoyak, Billy Kametz, Michael Linden, and Nicholas Park all have moves, great voices, and charm by the bucketful. Next year, look for the company to offer their most ambitious season yet – a world premiere (Field Hockey Hot by local favorite Michael Ogborn), along with readings of The Life, Dogfight, Dani Girl, and A New Brain. I will leave to theologians the difficult question of what happened to Jesus after the crucifixion. But as a theater critic, I can say with authority that 11th Hour has risen.